Left: an Excirolana chiltoni specimen found on West Beach, Calvert Island, photographed by Andrew McCurdy and identified by Crystal Ernst. Right: showing the isopod's tiny size in comparison to a human hand. Photo by Kelly Fretwell. 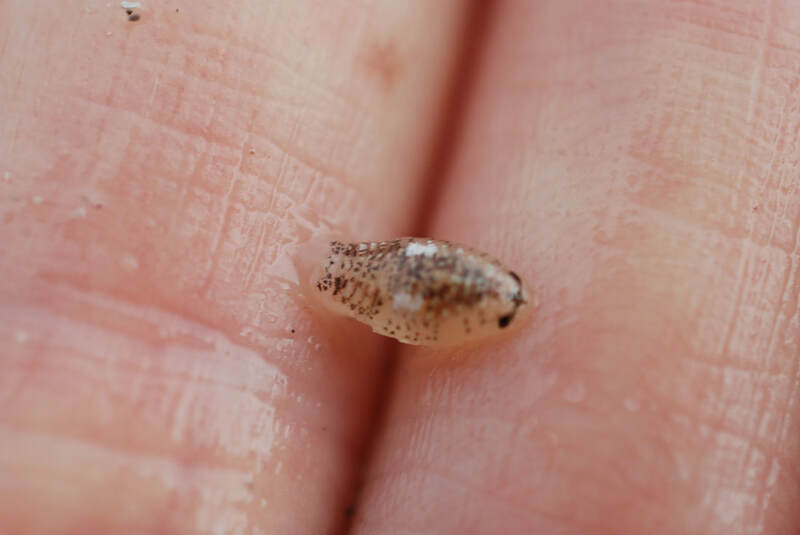 The first clue to barefooted beachcombers that this minuscule crustacean is around may be small but painful pinprick-like bites to the feet and ankles as individuals scavenge for fleshy food. 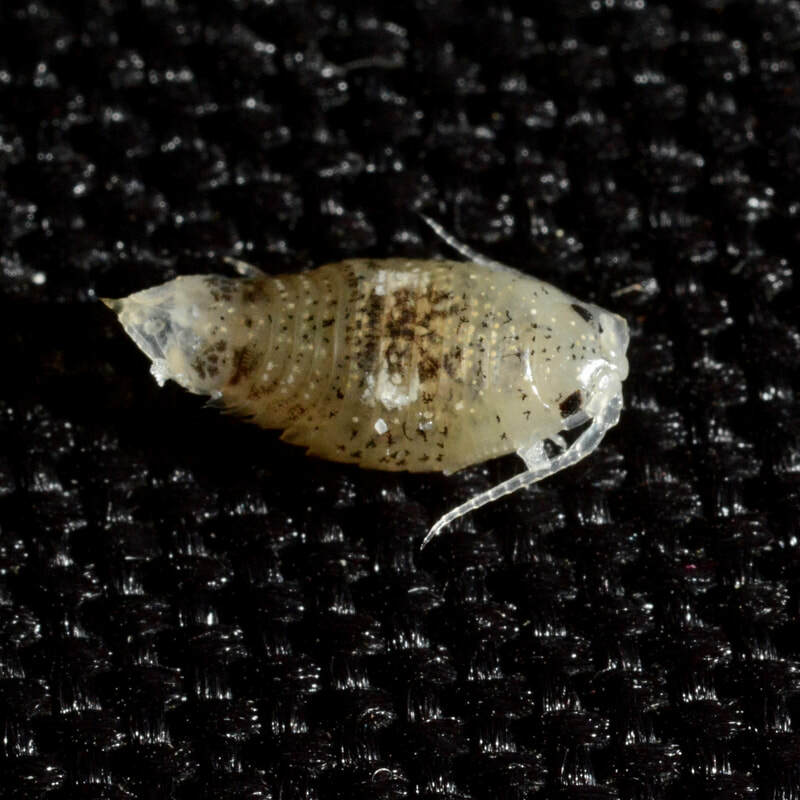 Given its tiny size (less than 1 cm long), this isopod will likely be tricky to differentiate from other similar-looking species found in the Pacific Northwest — however it may be ﻿the most common﻿ Cirolanid isopod in the region (species in Family Cirolanidae), at least of the Excirolana genus. See more images on the BugGuide species page. This isopod inhabits the intertidal zone of sandy shorelines, where it can be found in shallow waters and in wave swash along the tide line, alternately scavenging and burying itself in the sand. It has been recorded along shorelines on both sides of the Pacific Ocean: south to Japan and China in the northwest Pacific and northern Mexico in the northeast. 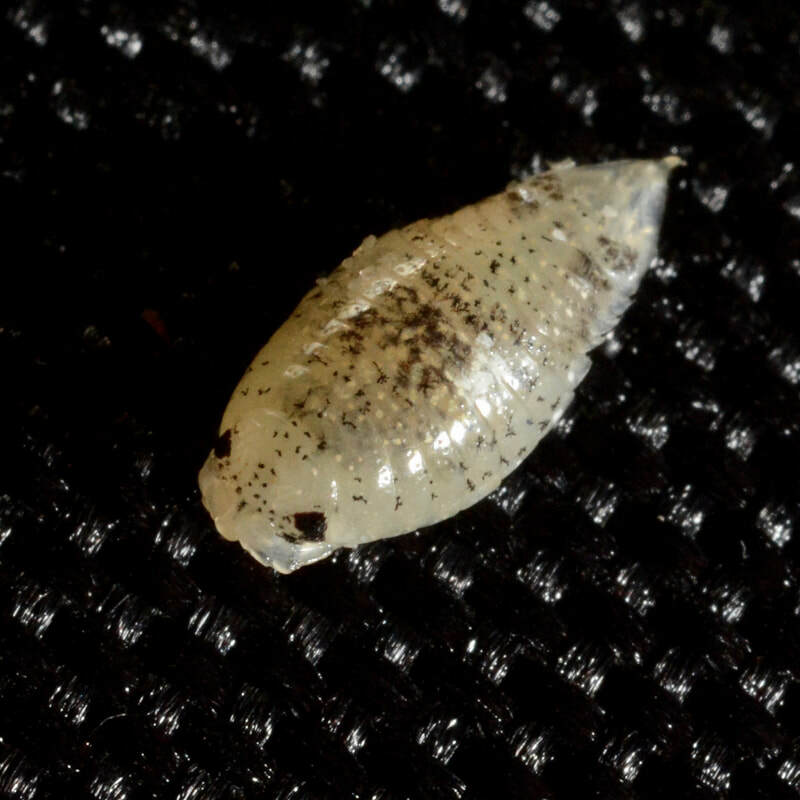 Another tiny scavenging isopod, Cirolana hardfordi, has also been commonly recorded in the Pacific Northwest from BC to northern Mexico. These and other similar species are differentiated by small morphological differences that may not be easy to recognize, and may require taxonomic expertise to confidently identify. Note that these species may also be called by common names like water-line or scavenging isopod. Cirolanid isopods scavenge a variety of dead, dying, and living animals, from invertebrates and fish to mammals, and may be found swarming in large numbers around an an animal carcass washed up along the tide line. As mentioned above, human feet and ankles are not exempt from this isopod's diet, and while its tiny bite is in proportion to its size this species can be quite bothersome if present in large numbers. This 1993 LA Times article describes an "invasion" by this species along Newport Beach in California. Their ability to quickly strip flesh from other animals can make them a pest: they can damage fish cultivated in net pen fish farms, and can hinder the work of forensic pathologists with regards to drowning victims. Cowles, D. (2007). Excirolana kincaidi (Hatch, 1947). Invertebrates of the Salish Sea. Rosario Beach Marine Laboratory. Accessed 07/03/2018. Excirolana chiltoni (Richardson, 1905). SeaLifeBase. Accessed 07/03/2018. Thomson, M. (2013). Mouthparts and their setae of the intertidal isopod Cirolana harfordi. Journal of Microscopy, 252: 111–121. doi:10.1111/jmi.12075.